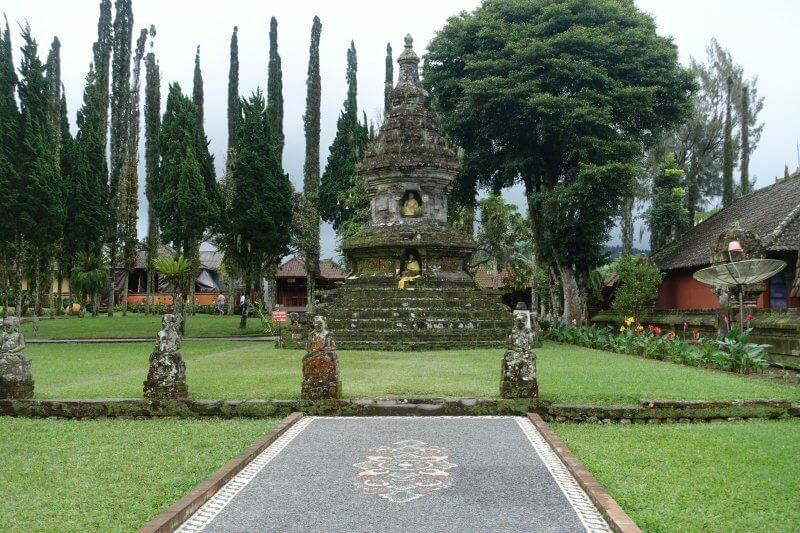 Without the luxury of time we decided to go on a one day private tour of north Bali to be able to see more sights on our third day in north Bali. Leaving the coast and going up the mountains down south, the sights that awaited us were truly breathtaking. After the warm welcome Nyoman gave us on our first day to Lovina, we were happy to have him show us around north Bali on this one day tour. Prices for similar tours should be around 450,000 IDR to 550,000 IDR. We started the day with great weather, driving straight down to Jatiluwih from Lovina. 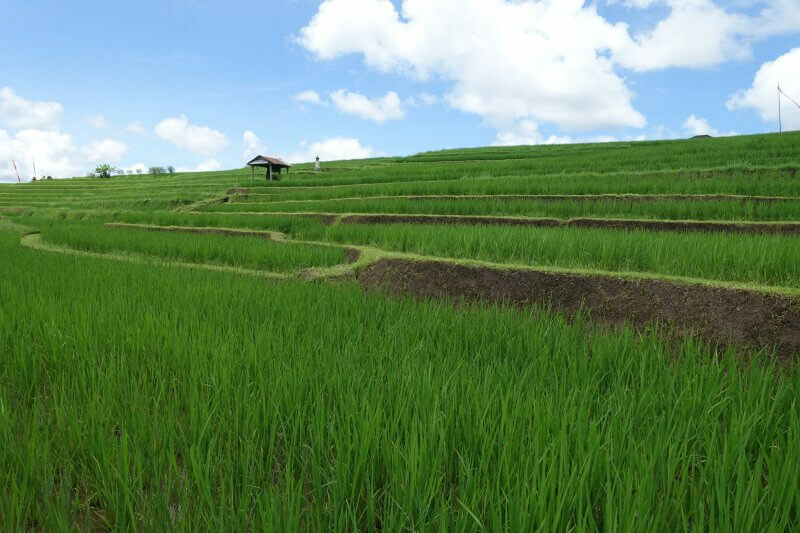 I heard of the famed rice terraces on my previous trip to Bali while at Canggu, but didn’t make the trip down as transport there as a solo traveler is a little tricky. After about an hour through mountains/forest roads, the vegetation suddenly cleared and it felt like we had arrived in some hidden paradise. 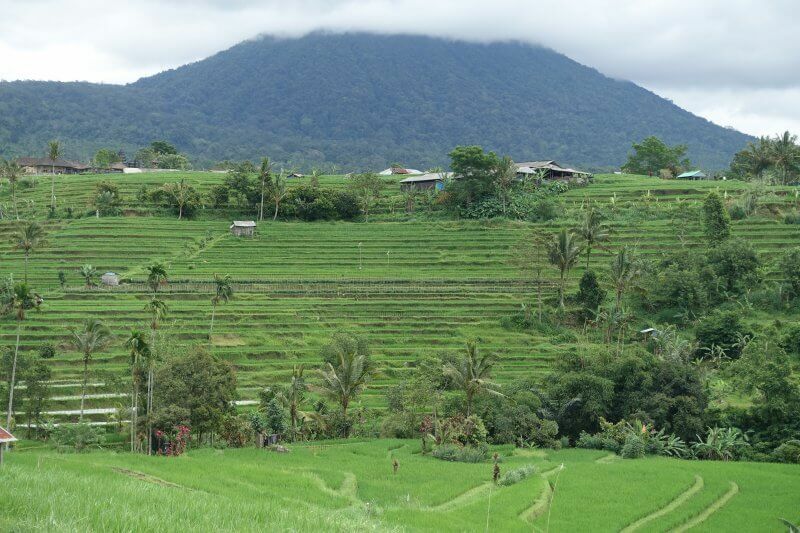 First glimpses of Jatiluwih rice terraces. I think the timing we arrived would be considered slightly early (around 10/11am) as we almost had the whole place to ourselves in the early part. Reminiscent of a Windows wallpaper. 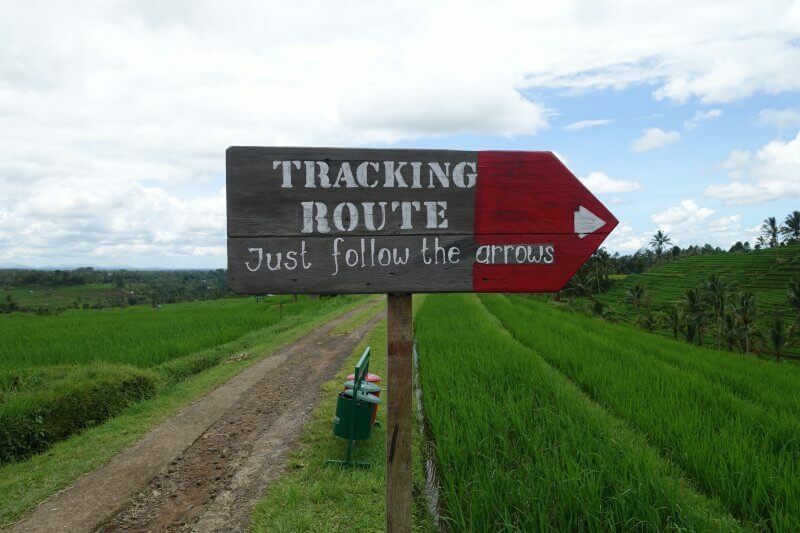 The expansive landscape at Jatiluwih, with beautiful rice terraces that seem to stretch on forever, is unlike any other. 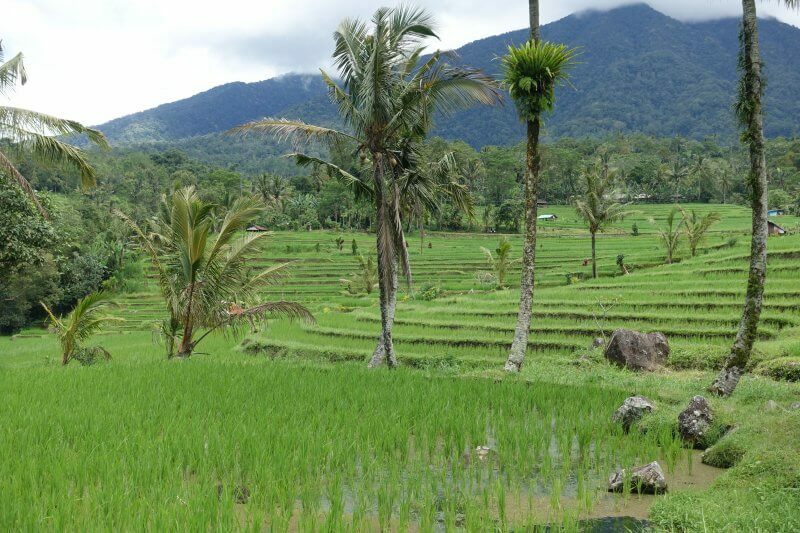 Terraced rice fields against the backdrop of the Balinese mountains. 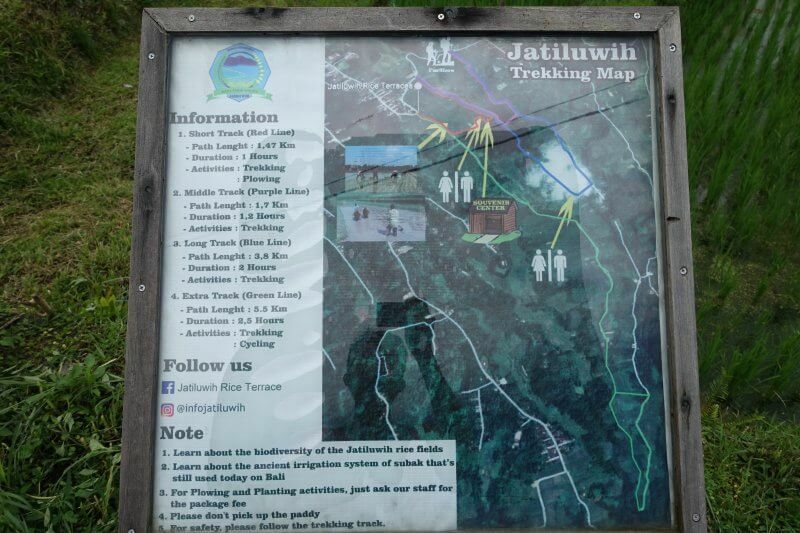 After seeing all this first hand it is not difficult to understand why so many people take the long ride through the mountains to experience Jatiluwih. 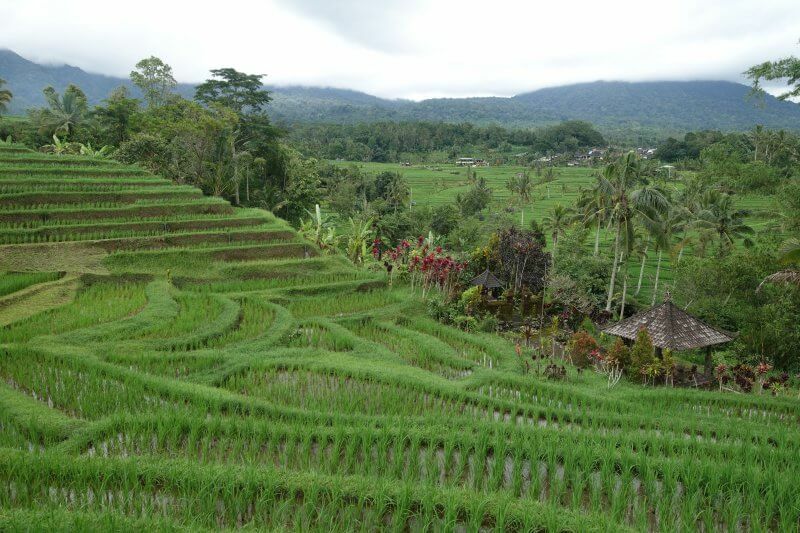 Those picture perfect rice terrace shots you’ve been seeing in magazines and tourism brochures are real! One last one of Jatiluwih. As we were about to leave I noticed that many more people had arrived and the rice terraces were starting to get busy. Glad that we managed to escape the crowds! 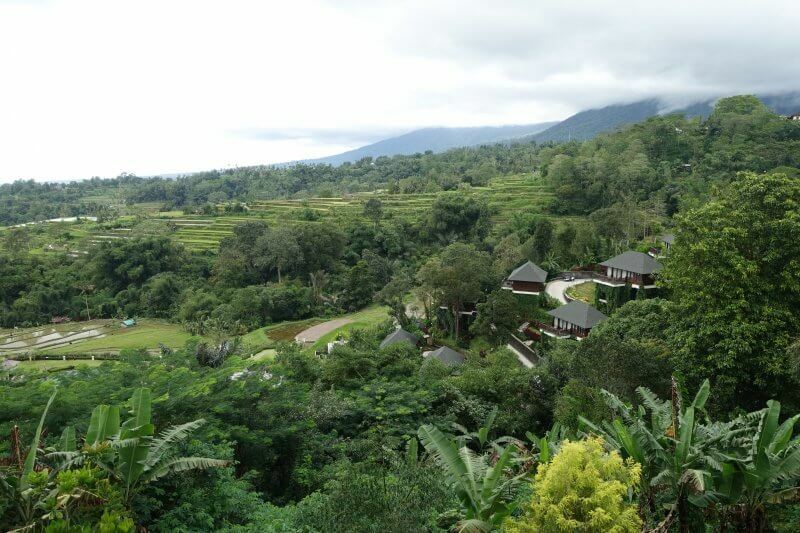 There were some cafes at Jatiluwih but we didn’t check them out as our next stop was at Pacung Restaurant, a popular tourist restaurant with sweeping views over endless rice terraces. The restaurant seemed to be a popular stop for tour groups and was huge, over 2 levels. 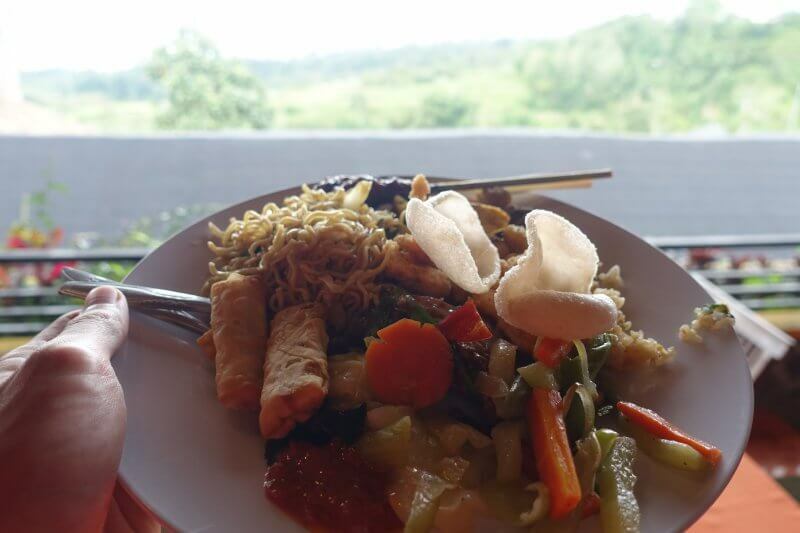 Lunch (120,000 IDR) is buffet style and you’ll get to try a variety of Indonesian food. 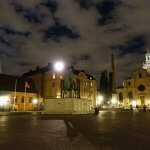 Once again, we barely escaped the crowds as tour buses poured in just as we left. Lunch at Pacung Restaurant, rice fields in the distance. Next up, more crowds (and possibly the most crowded site we visited in our 5 days in north Bali). Rain clouds started to gather as we headed further up the mountains to Danau Beratan. 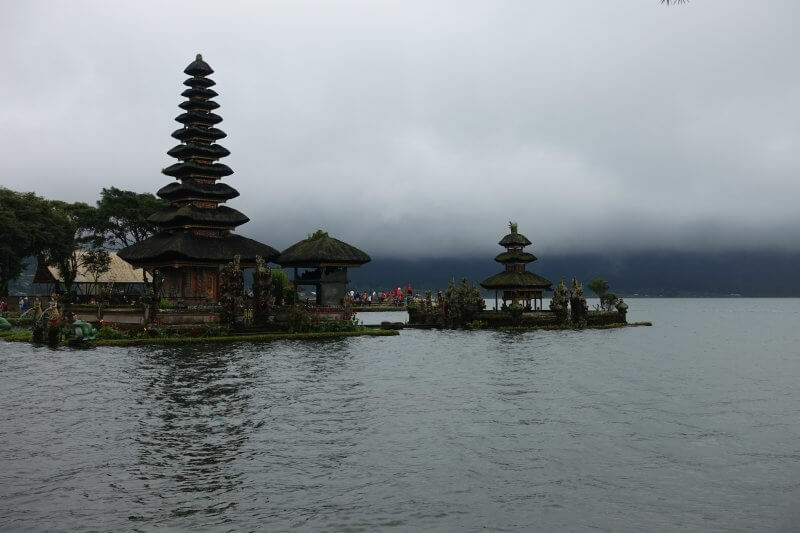 On the shores of Danau Beratan is one of the most famous temples in Bali, the ‘floating’ temple Ulun Danu Beratan (10,000 IDR). 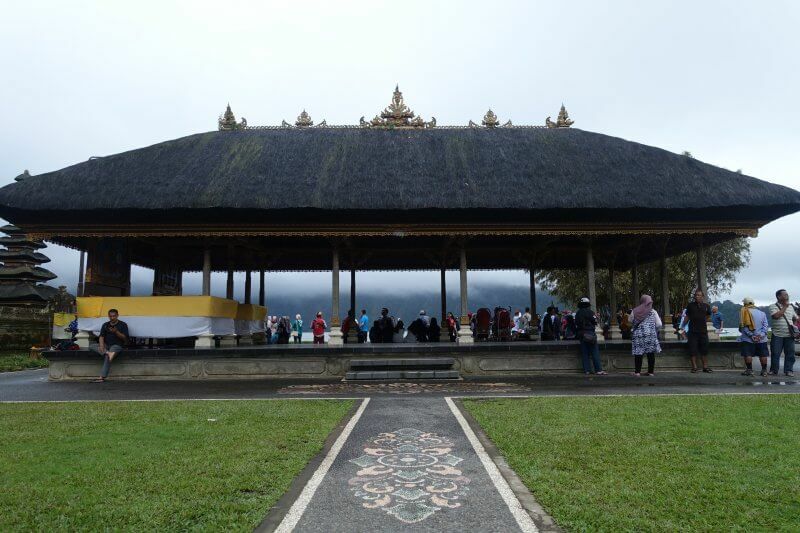 Ulun Danu Beratan, on the shore of Lake Beratan. Though weather was less than ideal, the low clouds did add to the atmosphere of the mysterious ancient temple on the edge of the lake in the mountains. Any concern of the temple being an overhyped attraction dissipated as we got up close with the 11 layered shrine. Temple hall by the edge of Lake Beratan. No doubt, Ulun Danu Beratan is a popular and crowded spot, but understandably so. The 400 year old temple set here on the lake high up in the mountains looks perfect in almost any weather. Different elements in the temple compound. The sky finally gave in as we left Ulun Danu Beratan and we were thankful for having a ‘roof’ over our heads in Nyoman’s car. 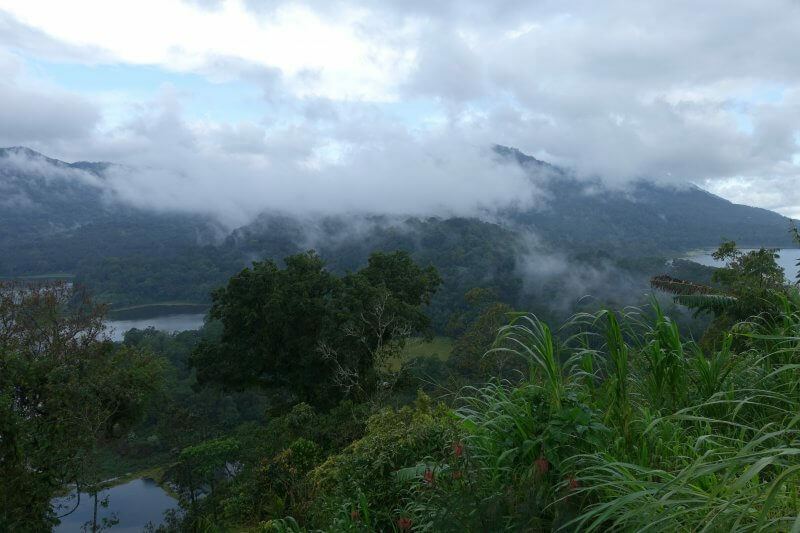 The next stop in our itinerary was a view point overlooking the twin lakes near Danau Beratan – Danau Buyan and Danau Tamblingan. 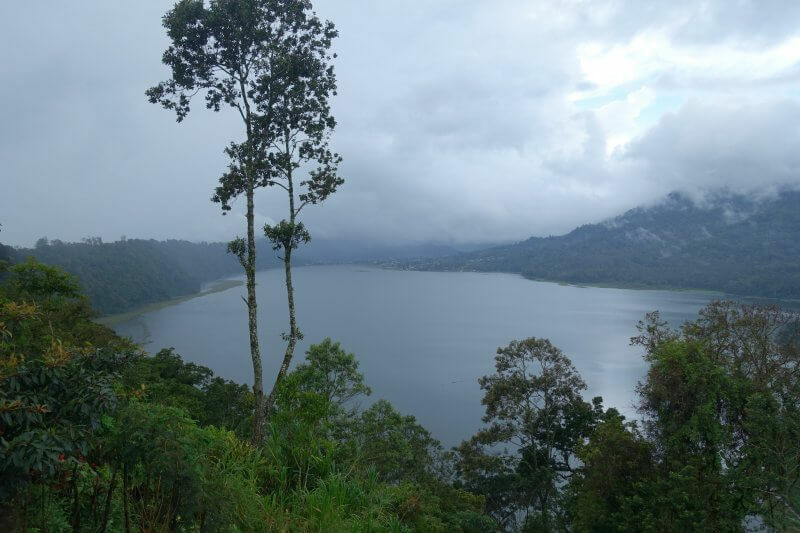 Many tourists visit the area around Bedugul near Ulun Danu Beratan but few venture to these other beautiful lakes nearby. Danau Tamblingan to the left, Danau Buyan to the right. Along the road up to where we stopped (between the 2 lakes), there were coffee shops lining the road, offering panoramic views of Danau Buyan and Danau Tamblingan (Lake Buyan and Lake Tamblingan). As time was running short, we did not take a coffee break here. Thankfully, the weather cleared up a little bit by the time we stopped and we managed to get some shots without getting wet. You can spot those little patches of blue opening up in the pictures. 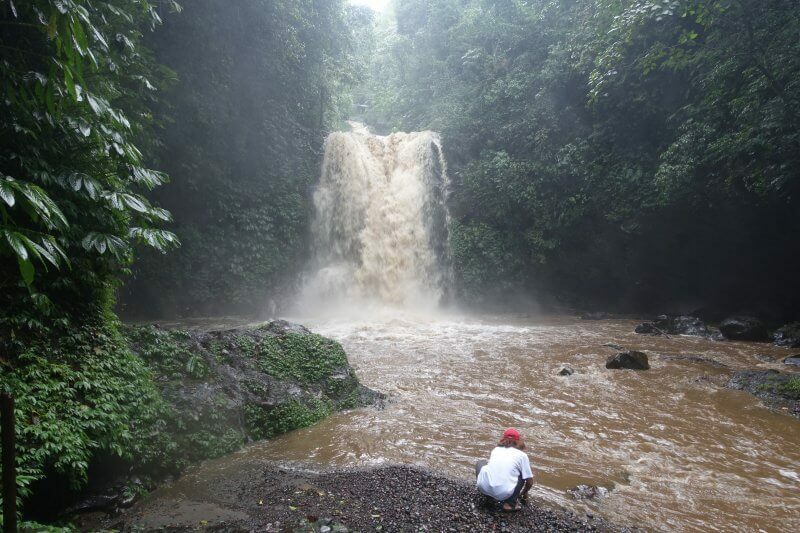 We learned from Nyoman that there are 3 Gitgit Waterfalls, all in close proximity of each other. Nyoman brought us to the least visited one to avoid being hounded by ‘tour guides’ all the way from the parking till the waterfall. I won’t be able to compare between the 3 Gigits now, but hopefully so in future. Indeed, the trail from the parking lot to Gitgit waterfall was free of not just ‘guides’ but of any other person. 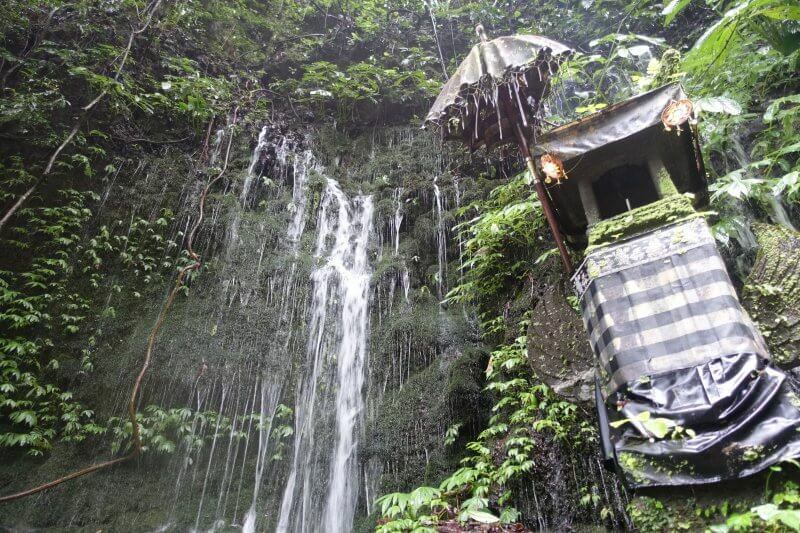 There was no entrance fee to the waterfall, just a small tip for the parking lot (5,000 IDR). As it was just after a heavy rain, the water flow was muddy and furious. The lone pavilion in the face of raging currents. Along the way there were a few smaller side waterfalls and a small altar. 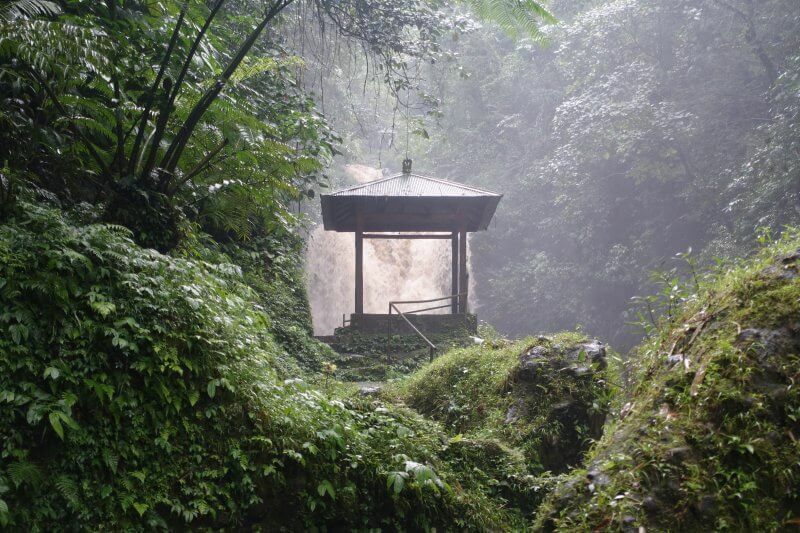 The small waterfall beside the altar was without the strong muddy current, and instead had a zen feel about it. 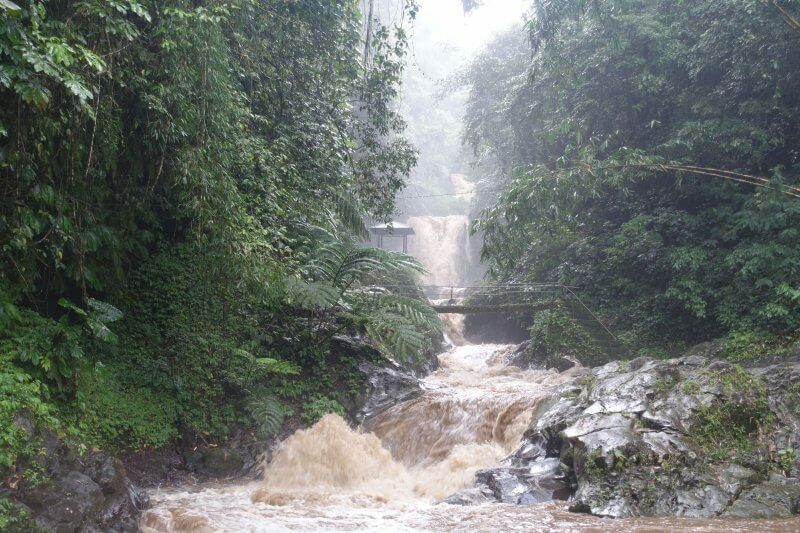 Finally we reached the end of the trail and were looking straight at the raging torrent of Gitgit waterfall. The mist generated was enough to get us wet even though we were some distance away. Didn’t get any close than that to Gigit waterfall 3. Nyoman was our impromtu guide for the Gitgit waterfall tour and he introduced us to various wild plants and fruits along the way in and out. One of the fruits he introduced to us was salak, a fruit we were to encounter again the next day at Bantiran. 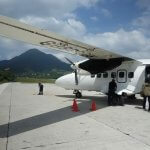 Weather got much better as we left the mountains for the beaches of north Bali. 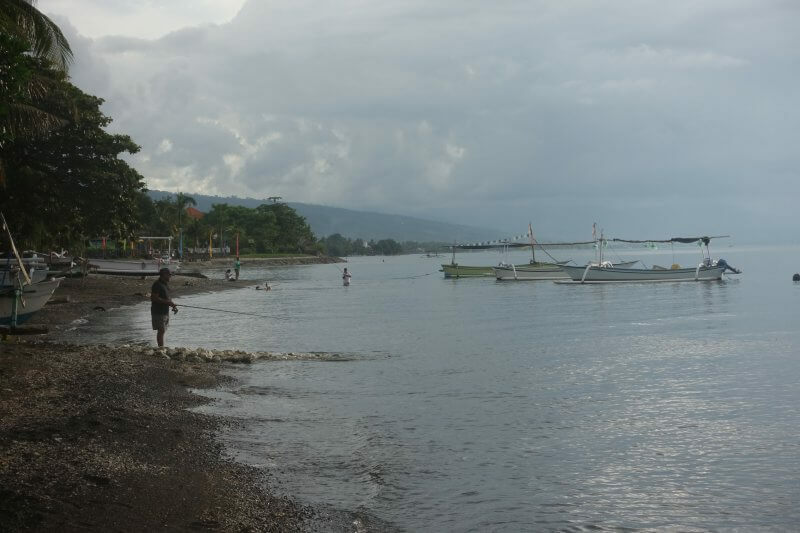 For our final stop, we visited the beach near Pemaron (village between Lovina and Singaraja), to unwind and relax. 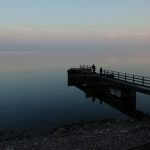 Similar to the seas at Lovina beach, the water was incredibly calm. The sandy part was shorter though, but water still quite clean. Comfy looking resorts line the beach. 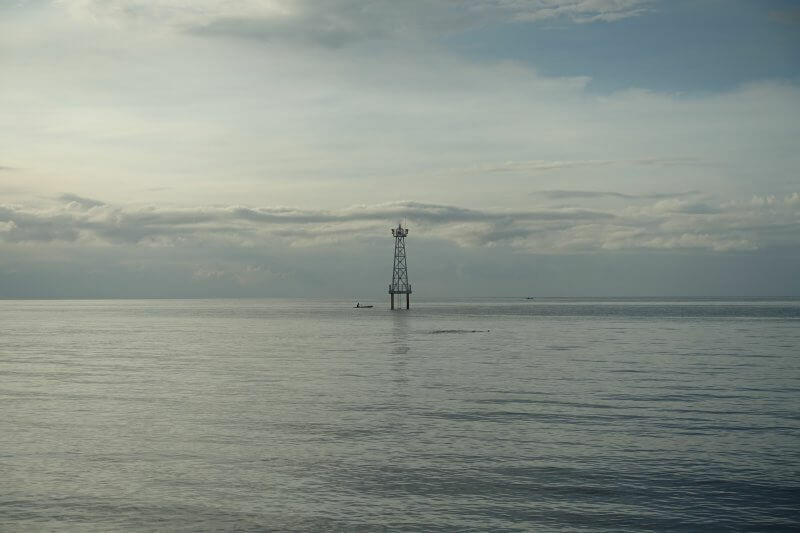 The waters off Pemaron beach. As the sun slipped away, we completed another amazing day in north Bali. Getting to see Jatiluwih, Ulun Danu Beratan, Danau Buyan and Danau Tamblingan, and finally Gitgit Waterfall, all in one day, was an eye opening experience of what Bali had to offer. 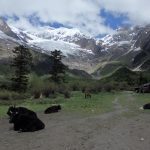 It was also a nice contrast to our previous day’s itinerary in historic Singaraja. 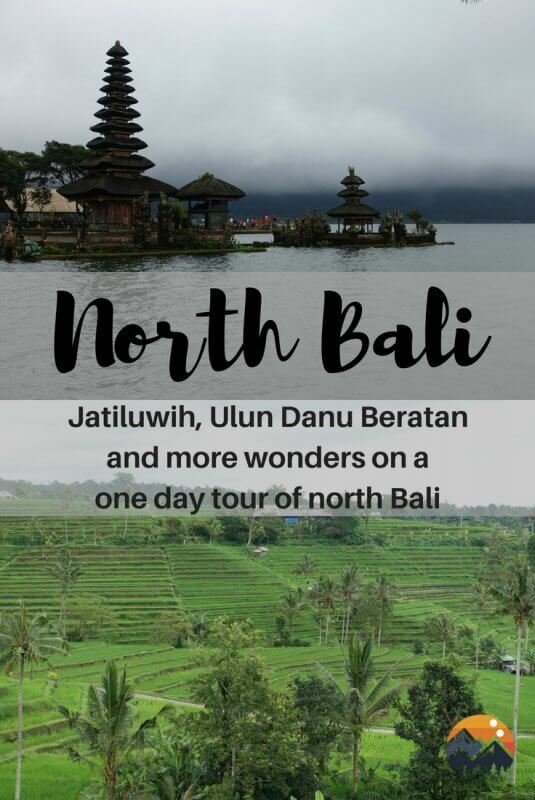 Next up, we continue to explore north Bali, this time to Banjar and Bantiran. Stay tuned for that post!